Included in this bundle - Full 1:50K OS GB Discoverer UK Maps worth £199.99, saving you 150! Now there’s one handheld GPS for many different activities. Whether you're on foot, on the road or on water, the new Garmin Montana 600 will guide you wherever you go. With a vast 4” sunlight-readable touchscreen that offers crystal clear enhanced colours, dual orientation display and high sensitivity HotFix® positioning to track your location, it’s easy to see where you are at all times. Both durable and waterproof, Montana 600 is built to withstand the elements. The Montana has key features for the outdoors such as a 3-axis tilt-compensated compass which shows your heading even when you’re standing still, without holding it level. It also has a barometric altimeter which tracks changes in pressure to pinpoint your precise altitude, and you can even use it to plot barometric pressure over time, which can help you keep an eye on changing weather conditions. 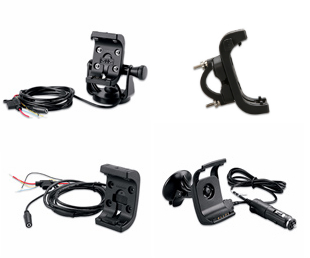 With an array of compatible mounts, the Garmin Montana 600 is designed for use on boats, bikes, as a handheld, motorbike or quad or in your car. Use the auto mount with City Navigator NT® or Garmin GB Discoverer™maps for spoken, turn-by-turn driving directions. Wherever you think you might take Montana, it has the mapping and mounts to get you there. Mapping options include the City Navigator maps for use in the car, BlueChart® g2 preloaded cards for a great day on the water, Garmin GB Discoverer™ which provides Ordnance Survey® mapping on your handheld andBirdsEye™ Select that lets you download customised sections of premium raster-based maps to your device and integrate them with your maps. Montana is also compatible with Custom Maps which transforms paper and electronic maps into downloadable maps for your device. With the Garmin Montana 600 you can share your waypoints, tracks, routes and geocaches wirelessly with other compatible Garmin GPS users. So now your friends can also enjoy your favourite hike or cache – simply press “Send” to transfer your information to other units. Montana 600 features a one-of-a-kind dual battery system. You’ll have the option of using the rechargeable lithium-ion pack or traditional AA batteries – whichever suits you best. 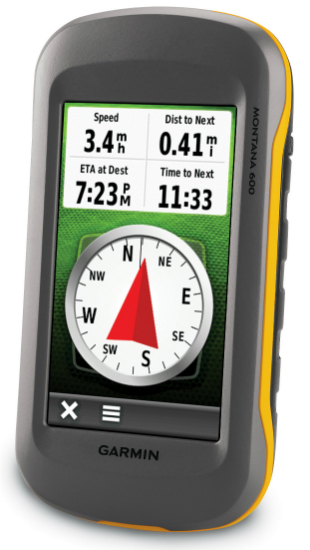 Garmin Montana 600 supports geocaching GPX files to download geocaches and details straight to your unit. Visit OpenCaching.com to start your geocaching adventure. Montana 600 stores and displays key information, such as location, terrain, difficulty, hints and descriptions, which means no more manually entering coordinates and paper print outs! Simply upload the GPX file to your unit and start hunting for caches. The Montana is the ultimate take-anywhere navigator for the serious adventurer.